Medical assistants play a key role in the smooth, safe delivery of health care in Kansas. Over the next decade, demand for well-trained medical assistants in Kansas will be on the rise-with the Bureau of Labor Statistics projecting over 20 percent job growth. Kansas schools offer nine-month to two-year programs in medical assisting. Students are trained in both administrative and clinical medical office procedures. Graduates of accredited schools can take an exam to become certified medical assistants (CMA), and other certification is also available in the state. Read on to find out more about certifications, schools, and salary information for medical assistants in Kansas. A great entry point for a health care career is as a medical assistant, where you can gain hands-on experience working with patients in a professional setting. Medical assistants work with physicians and other processionals in taking care of patients and keeping the back-end of medical offices running smoothly. 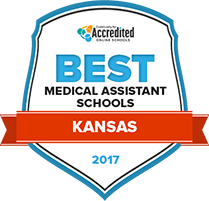 We’re helping you narrow down the program options by proving you with our list of Kansas’s Top Medical Assisting Schools for 2017. We looked at a wide range of factors, including career placement services, tuition rates and peer ratings. Check out these top-notch schools below. In the span of nine months, students attending Salina Area Technical College can complete a program in medical assisting that will help to ensure their post-graduation job aspirations are achieved. Salina Tech’s degree emphasis selections are vast, guaranteeing students from all backgrounds will be able to find a program that matches their goals. Students can accelerate their learning by utilizing summer or winter courses, and may find achieve greater scheduling flexibility by enrolling in online class sessions. Students attending Salina Tech can earn a college degree without putting strain on their finances by applying for financial aid coverage. Beginning a career as a medical assistant is made easy with Coffeyville Community College’s one-year medical assisting program. Throughout this program, students will learn critical skills in hospital management, monitoring patient vital signs, and processing medical payment and insurance coverage, all of which are necessary for successful post-graduation job placement. Students attending CCC will be provided with all necessary student services that have been proven to improve success rates, including academic advisement and personal counseling offices. CCC’s classes are small, allowing students to have more interaction with their peers and professors. Whether a student is interested in completing a full two-year associate of applied science program, or they’re wanting to only take a few credits to complete a certificate, Wichita Area Technical College has a medical assisting program that will fit their needs. By completing one of these programs, students will heighten their career opportunities in a medical-based environment, such as hospitals, doctor’s offices, and medical clinics. If students want to attend WATC but are faced with an already busy schedule, they should consider WATC’s online learning opportunities, allowing them to further their education in their downtime. Finding the right school is an important first step in starting your career as a medical assistant. Our search tool can help you find and compare medical assisting programs offered Kansas community colleges and technical colleges, as well as for-profit private colleges and career schools. Some schools offer additional training and certifications. How does Kansas define "medical assistant?" Kansas does not strictly define the scope of practice for medical assistants. It is among a handful of states that allow medical assistants to perform routine clinical duties by exempting those procedures from licensing requirements in the state. Kansas's Healing Arts Act and laws regulating the practice of professions including nursing, provide practitioners with an understanding of what can be delegated to medical assistants. Certification is not required, but it may be preferred by some employers. Additionally, some medical facilities may be required by their insurance carriers to employ certified medical assistants. Yes. Some certifying agencies for medical assistants require work experience or education in addition to an examination. The American Association of Medical Assistants (AAMA) is the credentialing body for Certified Medical Assistants (CMA). CMA candidates must be recent graduates of medical assisting programs accredited by the Commission on Accreditation of Allied Health Education Programs (CAAHEP) or Accrediting Bureau of Health Education Schools (ABHES). While the Certified Medical Assistant is the most commonly recognized credential, there are several others. Is a formal education and training required? While formal education and training is not required by Kansas law, some Kansas employers prefer to hire graduates of certificate, diploma, or associate degree medical assistant programs. Many Kansas employers also prefer to hire certified medical assistants (CMA). Are there additional requirements to become a medical assistant? Medical assistants may be required to pass a background check and drug screening in order to be hired. Some employers may also require specialized training such as CPR or medical coding. Are there tasks outside the scope of medical assistants in Kansas? Kansas is a state that allows medical assistants to perform routine clinical tasks under the supervision of a licensed practitioner by exempting those routine procedures from licensing requirements. As such, there is not a strictly defined scope of practice for medical assistants. Kansas law, for example, allows anyone the physician deems suitably trained to perform venipuncture for the purpose of drawing blood or inserting an IV. Duties such as prescribing medication, which are specifically regulated to nurses or physicians, may not be performed by medical assistants. Below is a comparison of 2014 salary data for medical assistants in Kansas and in the nation as a whole according to the Bureau of Labor Statistics (BLS). Medical assistant salaries not only vary from state to state, but within a state as well. In Kansas, medical assistants earn the highest hourly median wages in Lawrence-over of $2 an hour more than in Manhattan. There is an increasing demand for medical assistants across the nation and Kansas is no exception. This national trend is driven by two main factors-an increase in access to preventive care due to the Affordable Care Act and an aging population. As a result, medical professionals are relying more heavily on medical assistants to ensure their offices are running smoothly. Kansas has a medical assistant training and degree programs offered through private, community and technical colleges. Some programs will offer online or hybrid programs in addition to traditional campus-based courses. It is important to find a program that is accredited and well respected. Here are a few options to get you started in your search. Visitors to this site can use a search tool to find accredited schools in Kansas. This site also offers a search tool for accredited schools in Kansas. Provides a searchable version of the Kansas Healing Arts Act, which describes the rules and regulations that guide practice for physicians as well as institutions. An important aspect of this site is the Nurse Practice Act by Statute or Rules and Regulations, which provides detailed information on the scope of practice for nursing and the administrative and clinical tasks that cannot be delegated to unlicensed personnel including medical assistants. Provides salary information for medical assistants in Kansas as well as job listings.